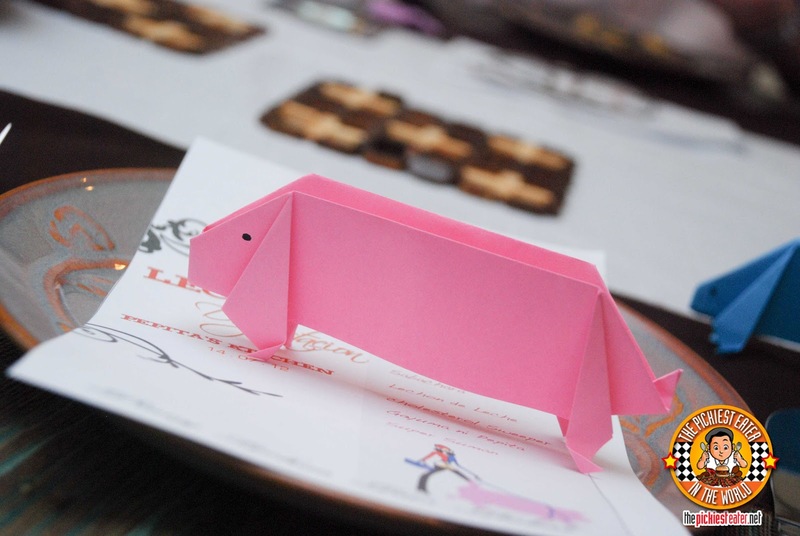 THE PICKIEST EATER IN THE WORLD: 14 COURSES.. LECHON DEGUSTATION AT PEPITA'S KITCHEN!! 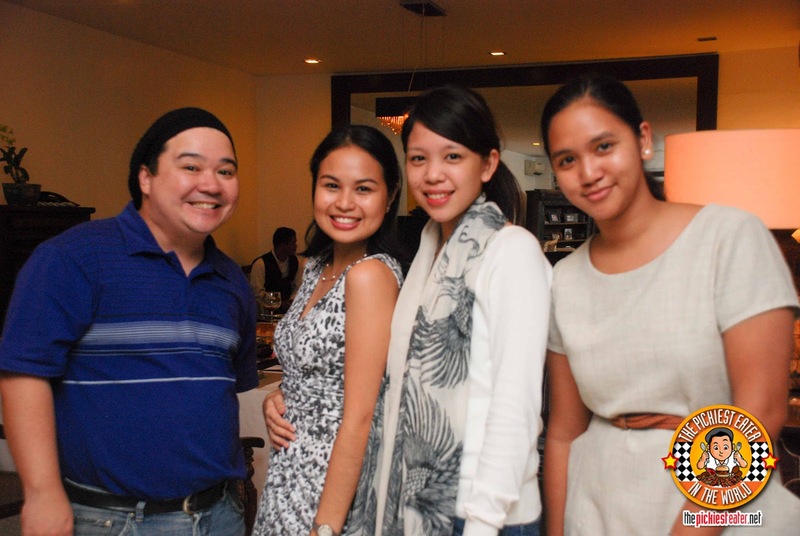 14 COURSES.. LECHON DEGUSTATION AT PEPITA'S KITCHEN!! 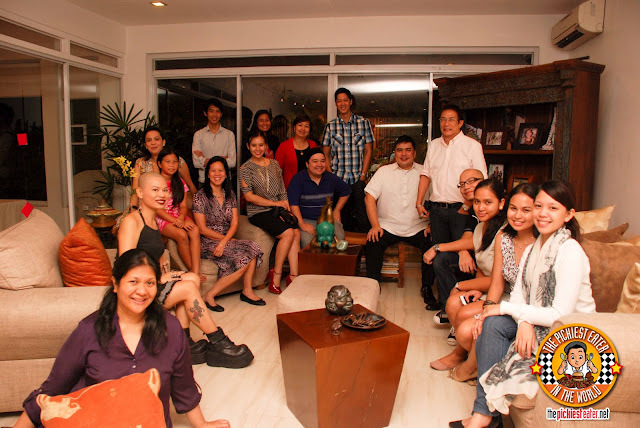 One of my new years resolutions as a blogger, was to make sure I attend more blogger events that I'm invited to. I was very hesitant to go last year, mainly because I was a bit shy (I really didn't know anyone from the blogging world yet), but Rina convinced me that if I had any intention of taking my blog to the next level, I was going to need to break out of my shell (I'm being serious by the way). 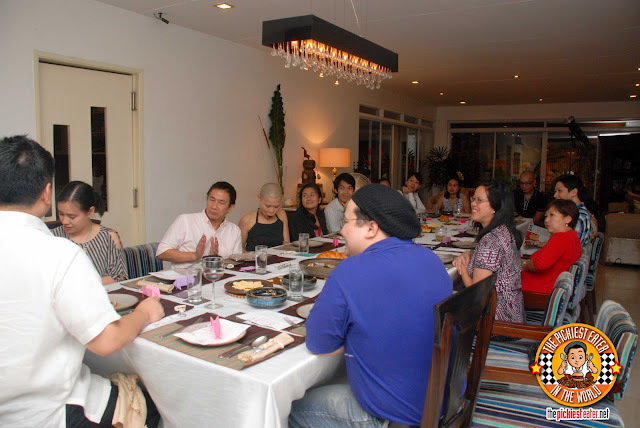 Perhaps one of the events that I had been dying to go to, was the Lechon Degustation hosted by Pepita's Kitchen. 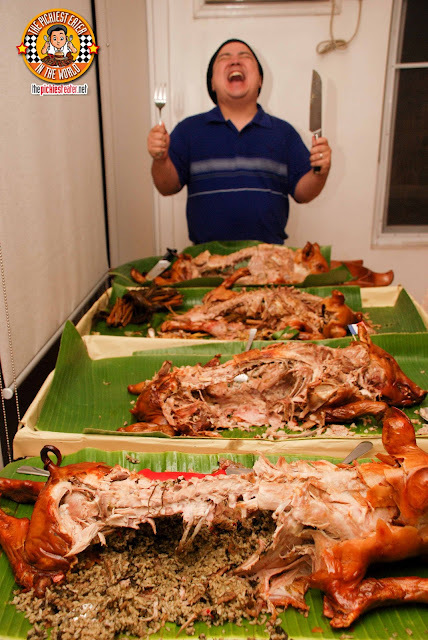 When I had heard about that magic night of Lechon concoctions, I had told myself that if ever I get invited to that event, I'm dropping anything and everything I'm doing to make sure I'm there. I bumped into Dedet De La Fuente, owner of Pepita's Kitchen, during Yummy Eats, where she thanked me for the video I made about her two daughters, Lileya, the 12 year old that made a version of Butter Beer here in the country, and Liyora, the young girl that created "Chocolate Happiness". She was proud to note that Liyora's efforts to sell her chocolate treats was able to help buy three wheelchairs for children in need.. Quite an achievement for a nine year old girl! Since Dedet was manning a booth at Yummy Eats that featured her trademark lechon, our conversation was cut rather short, but as we said our goodbyes and went our own ways, she turned around and called out to me.. (Well.. she actually yelled out, "Pickiest Eater!") and said, "Please come to my next Lechon Degustation this June!". I think I may have actually shouted out "Yes!" even before she finished her sentence. 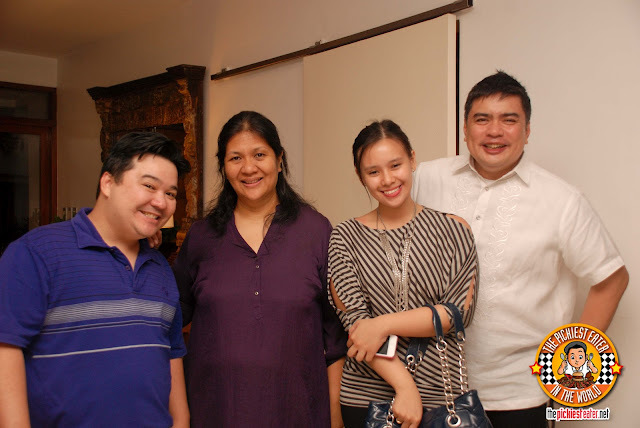 A couple of days prior, I attended a blogger event at a Japanese restaurant (Posting about it soon! 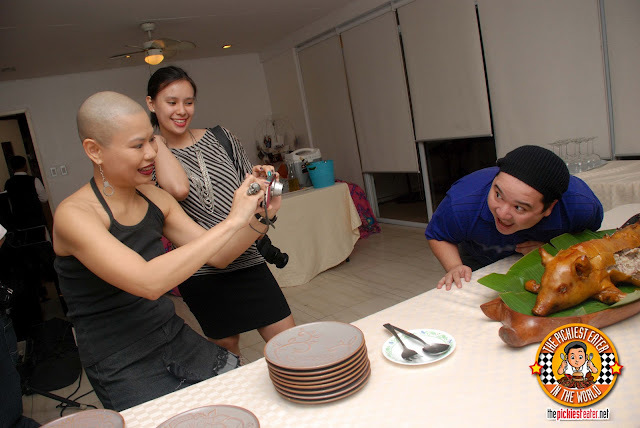 ), where I was joined by food bloggers Franny Wanny and Tales From The Tummy (Not their real names). Both of them had already experienced the Lechon Degustation of Pepita's Kitchen, and when I told them that I was going to be attending the one in two days, both of them asked me the same question.. "Then what the hell are you doing here??". That notion was reinforced by the text I got from Blogger and Professional Hellraiser, Spanky Enriquez, who also happens to be the man helping Dedet coordinate the evening's festivities the morning of the event. His text was simple, but the message was clear: "Do. Not. Eat. Lunch." Apparently, the only way to prepare yourself a night of sinful gorging, is to not eat for two days. It all made sense when I finally arrived and saw what was on the menu. 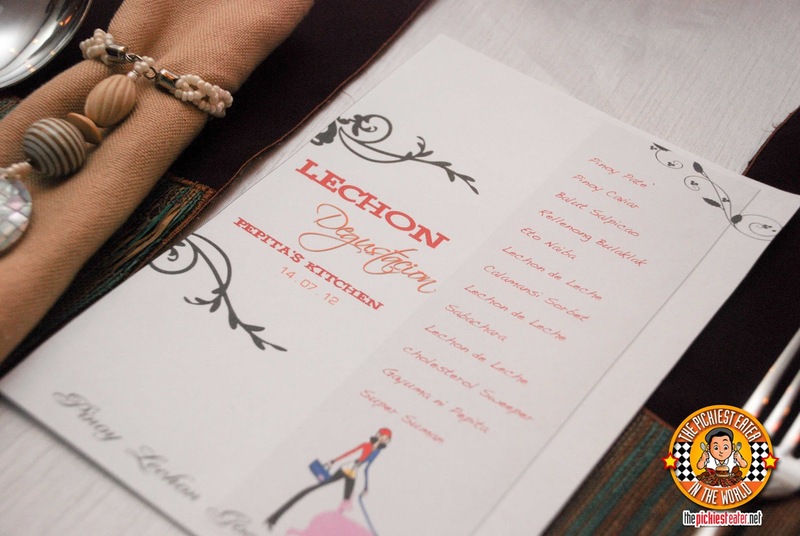 The night's menu consisted of a Fourteen course meal, and included not one.. not two.. not three.. (not Five).. but FOUR Lechon De Leches prepared different four ways. Placed on the table was a roll of bread shaped like a little piglet, setting the tone of how the evening had in store for us. It seemed a bit too cute for anyone to eat because I noticed it was still there at the end of the night. We were a tad bit late, but appetizers were already being served, starting with the Pinoy Pate' and Pinoy Caviar. 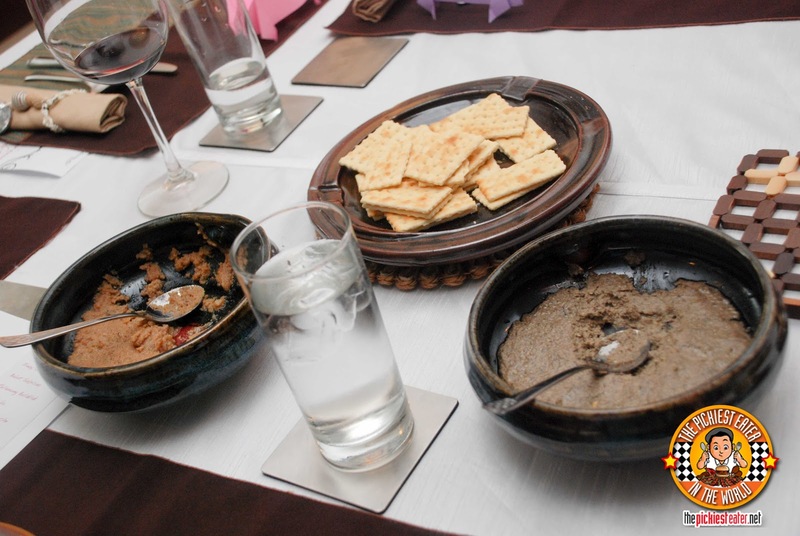 The pate' was actually made with a balut egg, while the Caviar is made with fish roe and cooked Pinoy Style. Ok.. Squash Flowers? What the hell is that? Squash is actually one of the few vegetables I willingly eat. And apparently they come in a flower form? 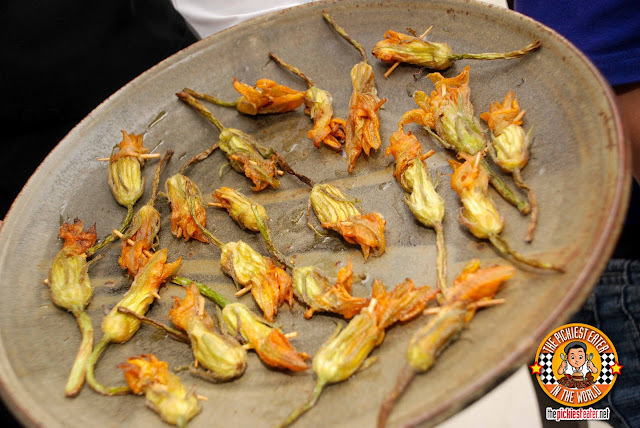 Hehe sorry.. My knowledge in vegetables is admittedly rather weak, but basically, the Rellenong Bulaklak is squash flowers, stuffed with Kesong Puti and anchovies, then deep fried. It was actually really quite delicious. It had a touch of sweetness to it, and the cheese gave it a bit of creaminess to it as well. In all honesty, I didn't even notice the anchovy (which is good because its not something i'm fond of). Just before we could get things on, they brought out the very last thing I thought I'd ever see in the home of Dedet De La Fuente. A salad. 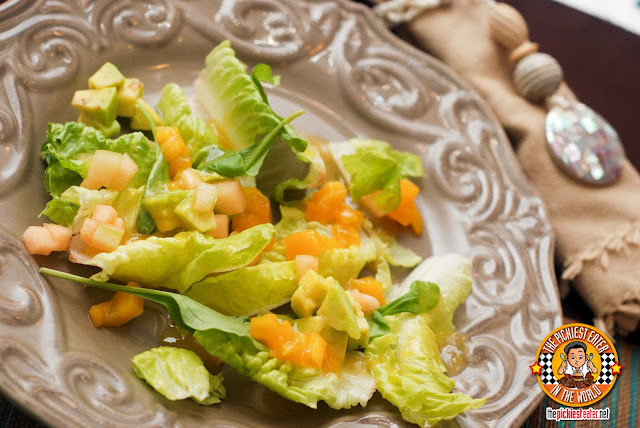 The salad is aptly called, "Eto Naiba" ("This is Different), because its technically the only healthy dish that will be brought out of the kitchen that evening. The salad consisted of minced fruits, such as Mango, Melon, and if i'm not mistaken, a little bit of Avocado, with a lightly sweet mango vinaigrette drizzled on it. It was actually quite good, and Rina polished off her plate awfully quickly. She was still looking for more, and me being the Knight in Shining Armor that I am, I gave her my share. I tried to do it discreetly, but dinner guest Katrina caught me in action! 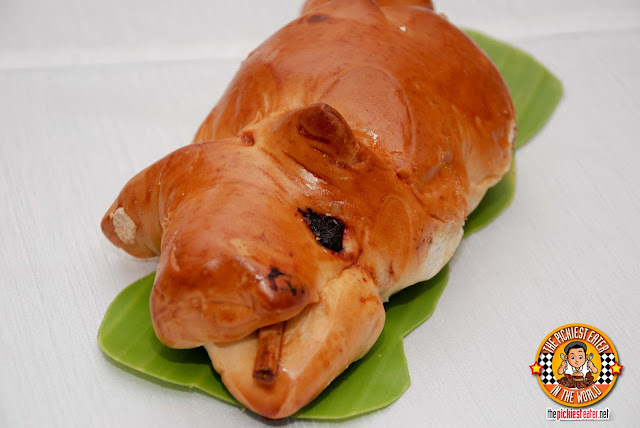 The first Lechon De Leche looked rather mundane. Don't get me wrong, it looked as if it were cooked beautifully, but I couldn't imagine what there was about it that would make it different from your average ordinary Lechon. And then they cracked the pig open, and the rice that had been roasted inside it spilled out. 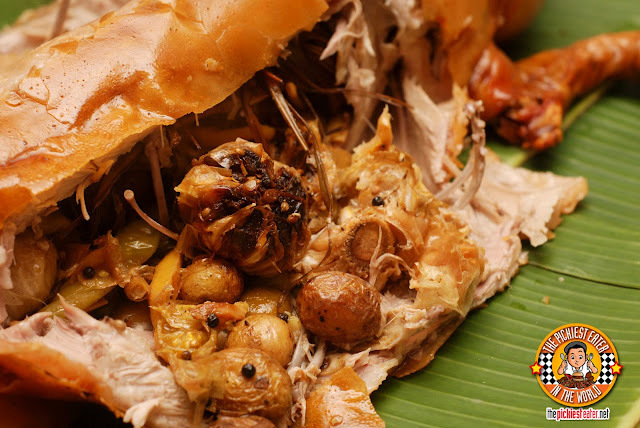 Pepita's Kitchen's Pinoy Lechon, is a beautifully roasted Lechon De Leche stuffed with sisig rice. The rice had the flavor of the Lechon meat soaked into it, and small bits of chili pepper added a nice touch of heat. To me, this was nothing short amazing. The skin was crispy perfection. 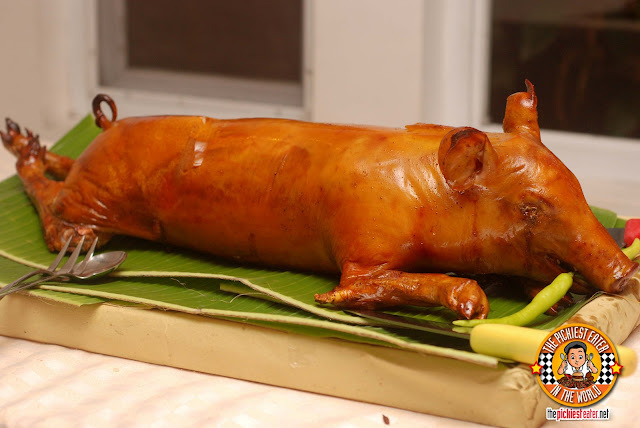 And because it was a young pig, it didn't have too much fat on it, making it a bit "healthier" than the normal lechon. It was so delicious, Rina and I went against our better judgement and went back for seconds.. A move that would prove costly to Rina later on. 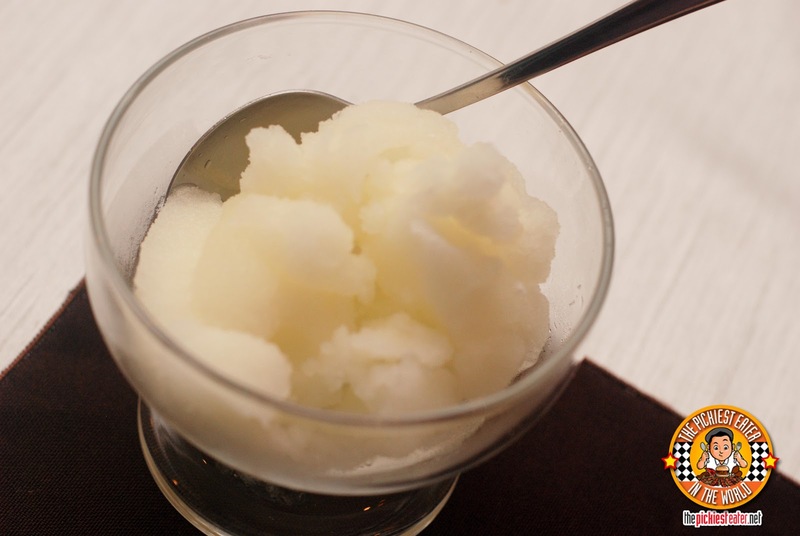 We were given a Calamansi Sorbet as a palate cleanser, and I found it to be absolutely refreshing. It reminded me of the the way I would drink Calamansi Juice as a child. Still with the citric taste, but tempered by a delicate sweetness. 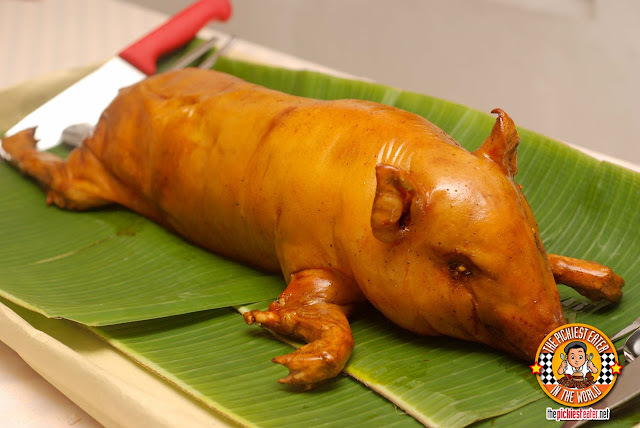 The next Lechon De Leche brought out was the German Lechon, which I dubbed as "Achtung Baboy", and is the favorite of Little Pepita. The mere fact that this little girl was first in the line despite the fact that she had probably had this more times than you can shake a stick, spoke volumes of how good this lechon must be. The insides were stuffed with huge cloves of garlic and marbled potatoes that were roasted inside the pig. 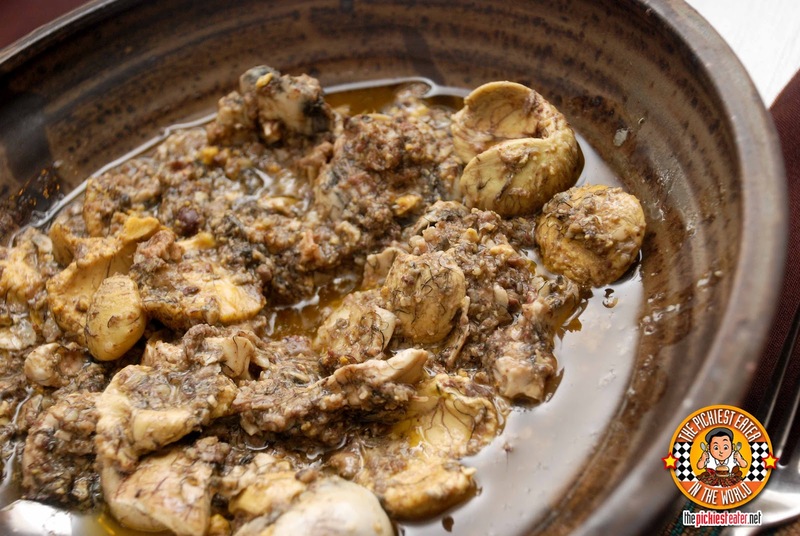 A beautiful herby fragrance emitted from the Lechon when it was chopped open. Liyora taught me how to eat this. You take a small piece of garlic, and potato, crush it with your spoon, and eat it with the chunks of Lechon meat and skin. I really loved this, and Rina did too, however the lack of rice made it lose so "Pogi Points" in Rina's eyes. 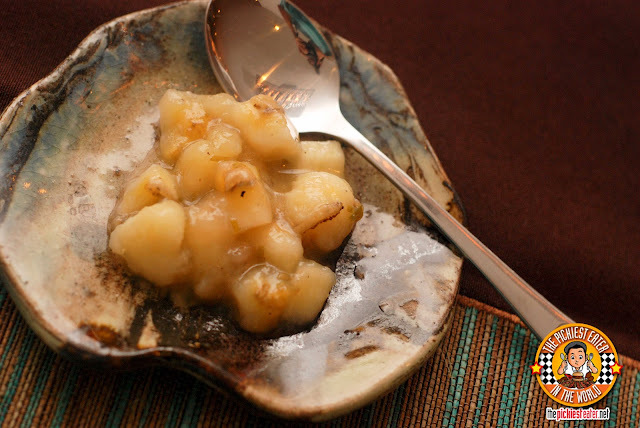 If a bowl of Atchara (Pickled Papaya) and a bunch of Saging na Saba (Bananas) had a love child, it would be called "Sabachara". It is the perfect representation of sweet and sour fusing together in one dish. It was a good counter to all the savoriness of the pork we were eating. 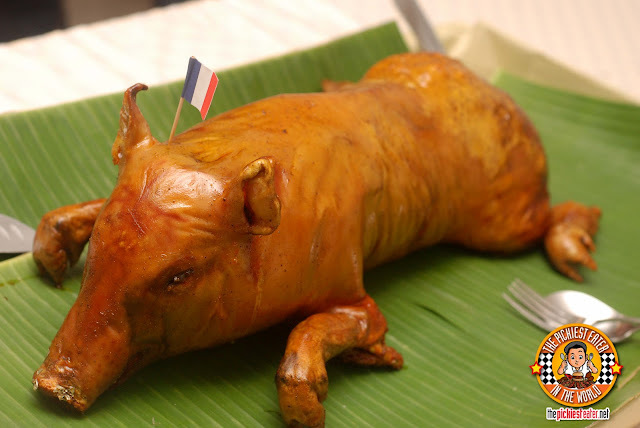 Our next Lechon was called the "French Lechon". The little porker had even a flag on the top of his head to prove it (I was hoping for a little beret, but maybe that would have been a bit too much). Inside the lechon was rice that had truffle oil and mushrooms mixed inside. The flavor of the rice was a lot milder than the previous two, but it was delicious nonetheless. 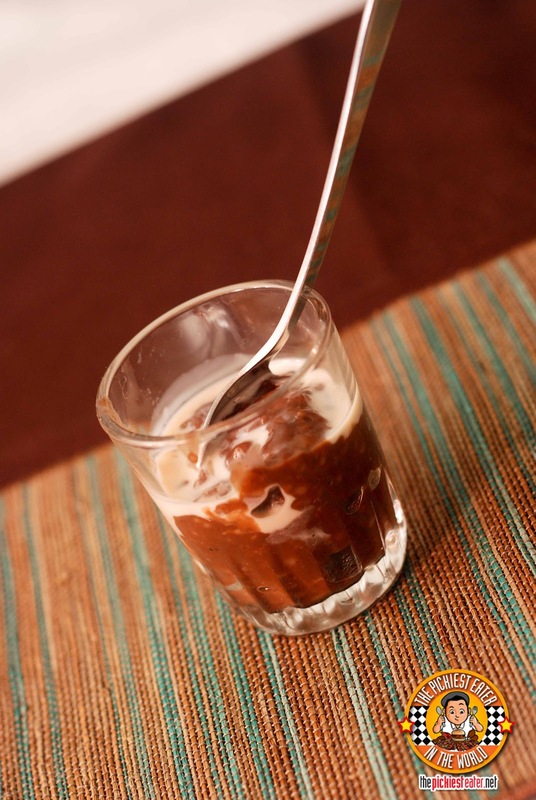 What followed was the dish known as the "Cholesterol Sweeper". I wasn't sure what exactly it was or how it was made, but it basically tasted like champorado.. A chocolatey rice porridge mixed in with a little condensed milk. Apparently they replaced the rice with oats, in an effort to assist in the cleansing of the body of the cholesterol from your body. 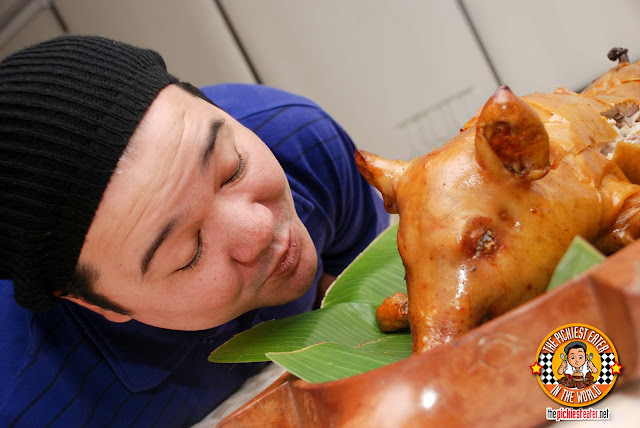 By the time the fourth Lechon arrived, Rina had given up, and decided that she would pass on tasting this. 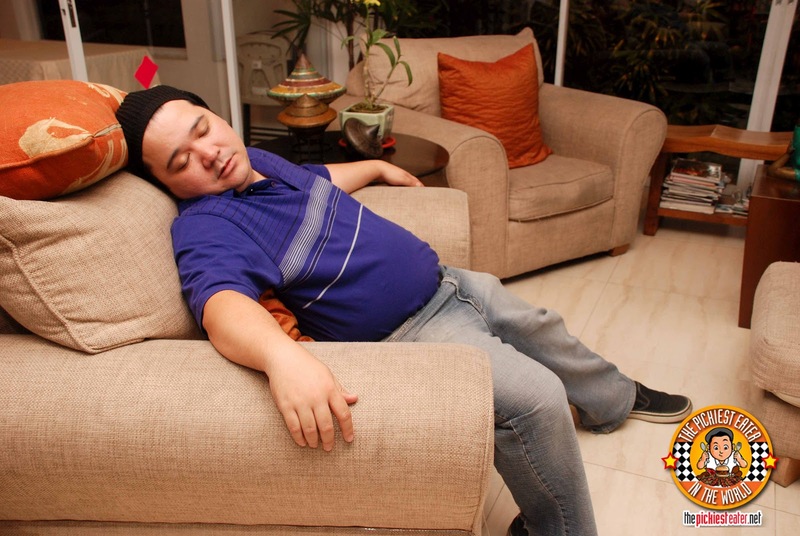 She was so stuffed she was starting to feel like she was being condemned to death by Lechon. Though the previous Lechons had been made before, This was the first time Dedet would unveiling her newest creation.. 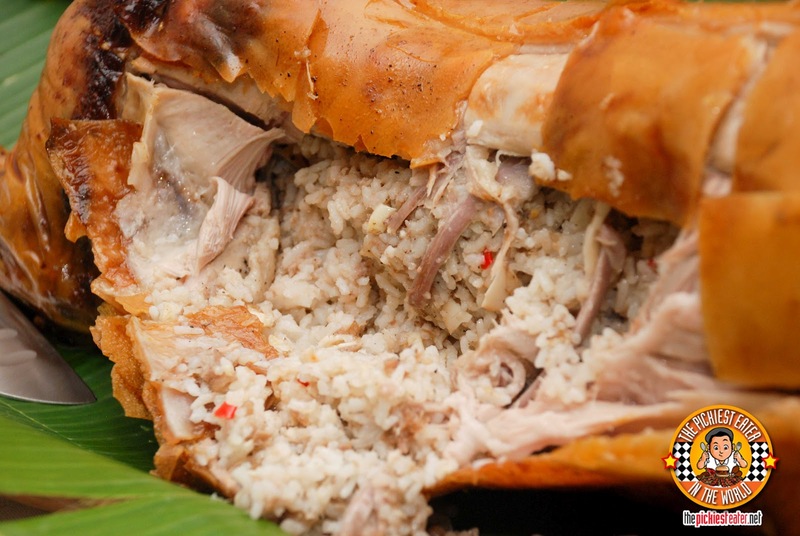 Inside the Lechon was rice, mixed in with the Filipino dish "Laing". The rice was mixed in with coconut milk and Gabi leaves, and had just the right amount of spice to it. In the Menu, it said the next item was called "Gayuma Ni Pepita". 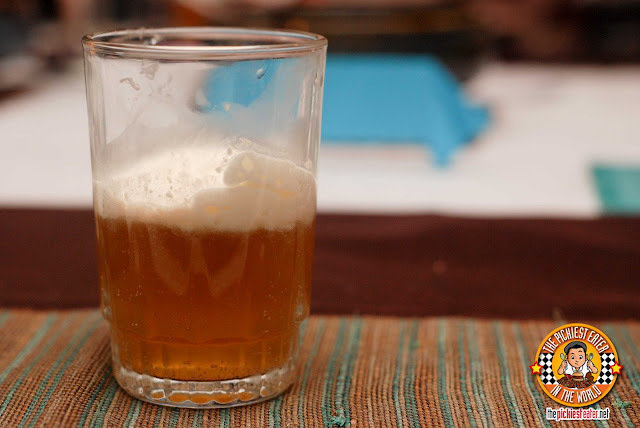 As soon as The waiters brought out the shot glasses, I knew it was the Lileya's version of Butterbeer that I had tasted at Best Food Forward. The best way to describe it, was that it tasted like a melted down butterball candy. 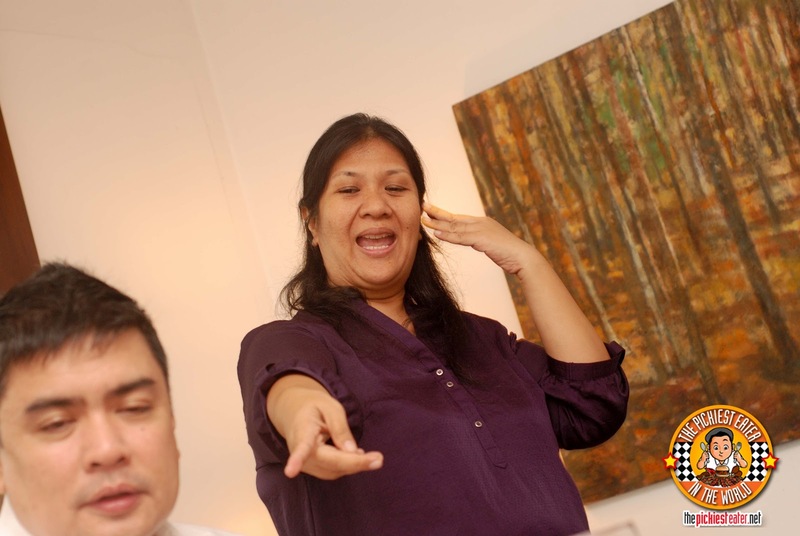 The grand finale was what Dedet called "Super Suman To The Max". This was an incredible creation, that incorporated a lot of Filipino goodies into one dessert. 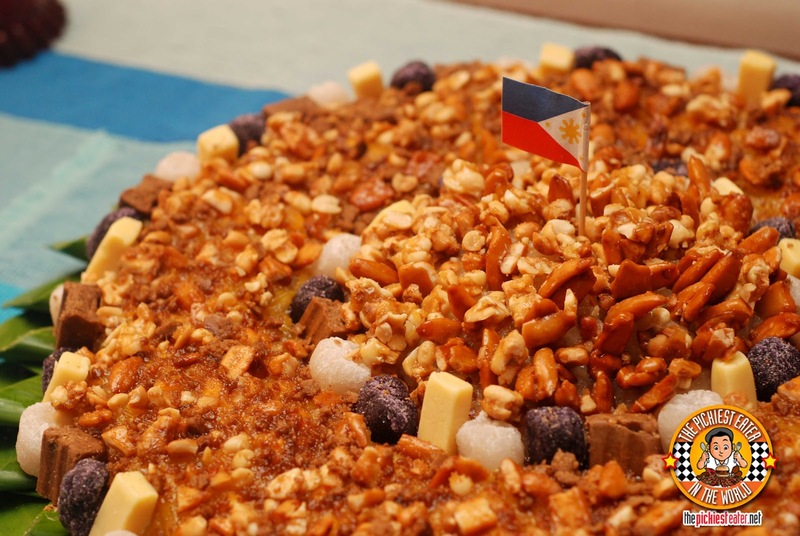 On the Suman, it included Yema, Cheese, Choconut, and some nuts, all on a bed of deliciously sweet sticky rice. A Perfect way to end an amazing meal. This was undoubtedly one of the best food experiences in my entire life. My favorite? 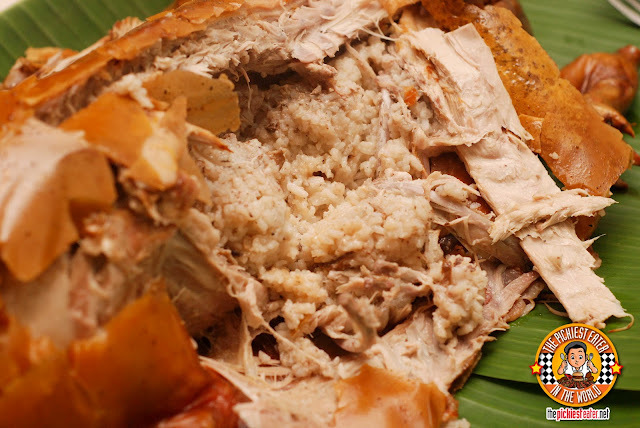 Its a close call between The Pinoy Sisig Rice Lechon, and the German Lechon, followed by the French Truffle Lechon, then the Laing. Our Host for the evening, Ms. Dedet De La Fuente, and the Master Of Ceremonies, Mr. Spanky Enriquez. The Lovely Ladies from Breakfast Magazine! I cannot remember the last time I was this full. Thank god for fluffy couches. Haha i gotta admit, it does have its perks!! Pork heaven is right, Edelweiza! reunion na naman sa sabado wooohooo!!! Be afraid.. be very afraid!! Rina and I can't wait! WOW, OH WOW! That degustation was DREAMYYY! Each course was really interesting. How I wish to try something like that someday. 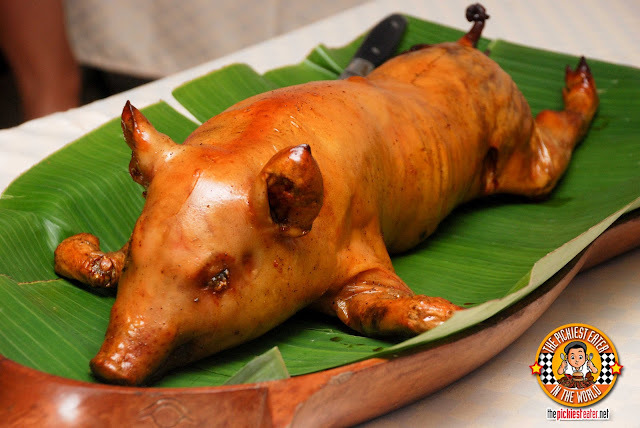 The Laing lechon looks and sounds really interesting. And "Little Pepita" pang junior master chef na!!! It's something everyone needs to try at least once in their life!! It was nice meeting you (again) too, Richie! ;-) I LOVE that first photo! Hilarious idea! 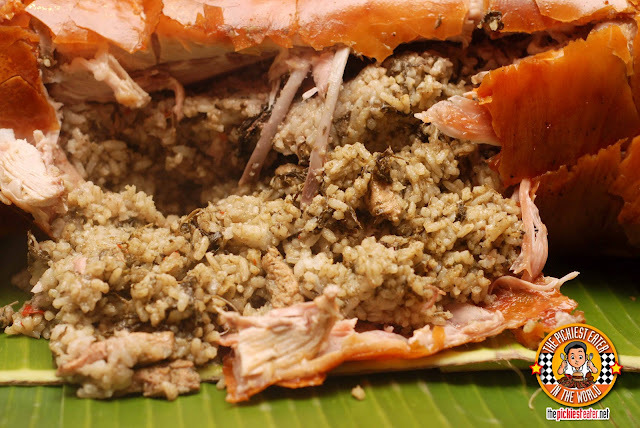 And you can tell that the Laing Lechon was served last, because it's the only one that still had stuffing left, while the first lechon is simot. I learned from the first time I went not to get seconds in the earlier courses. I definitely had seconds of the Laing, though, because I loved it and I knew it was the last one. Rookie mistake, going back for seconds, but one i'm not definitely going to regret hehe..
Ooohhhh.. It was yema! but it was a bit harder and the texture was different from the usual sticky yema I'm used to.. haha minus points for not listening! it's grade three all over again! but I have to agree with you... Rina and I attacked the suman the next day and it was still fantastic! Oh my dear god. What a spread! No wonder it takes a minimum of 15 people to polish it off. and even then, the last lechon was only half finished! Awesome!!!! Looks like you had a blast, bro!! how much does it cost roughly to book the Degustation dnner for 15 pax? just for information sake. Thanks! YABU: KATSU FOR 25 ? YES, PLEASE! WHEN IN CEBU: FUDGE RESTAURANT! !